Could you Bear to eat Pooh? Well our ancestors did… Bear was most definitely on the menu in the Palaeolithic and if you think bears are big now you should take a trip back to the Stone Age! Bears are an incredibly diverse species that have evolved from a single genus but now occupy dramatically different ecological niches across the planet. Because of their weight and size, they are classed as megafauna. Megafauna are large animals that usually live for a long time, have slow population growth, and low mortality because they don’t have many natural predators. There are lots of very cool prehistoric megafauna like the mammoth, sabre tooth cat, and several distinct species of bear. Humans have a long history interacting with bears, mainly because of our shared preference for sheltered spaces like caves and eating the same types of food. In Europe, both Cave Bears (Ursus spelaus) and Brown Bears (Ursus arctos) were present during the Middle Palaeolithic, which was 250,000-40,000 years ago and most frequently associated with the Neanderthals. 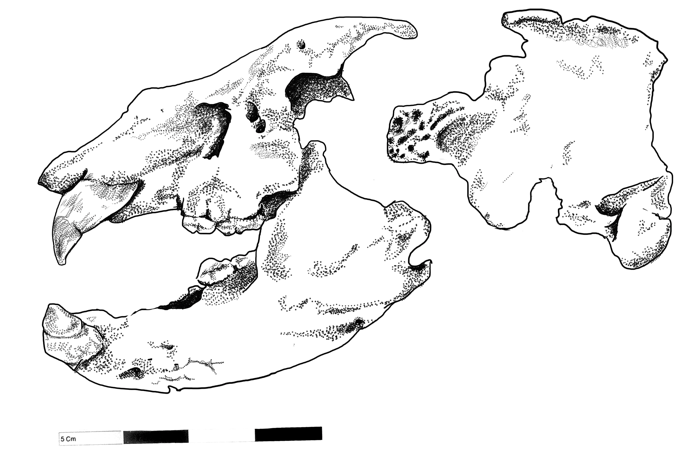 This is a diagram of the skull of a brown bear found at Banwell Cave in the UK. Drawing by Tabitha Paterson. This is a diagram of the top part of a cave bear skull. If you compare it to the brown bear skull above you can see the distinctive elongation and dome-shape of the cranium. This is one of the ways to tell apart brown and cave bear skeletons. Drawing by Tabitha Paterson. New research published by Romandini et al. (2018) highlights the relationship between Neanderthals and bears in southern Europe by studying bear and animal bones from Rio Secco and Fumane caves (Italy). 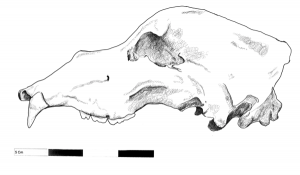 The study focuses on animal bones found at both caves, particularly bear remains. The bones were identified, and any cut marks present were studied using 3 types of microscope to separate those made by carnivores from marks made by humans using stone tools. The results were then compared with databases of known types of cut marks established via experimental work. Results suggest that Neanderthals were exploiting bears as a resource at both sites; however, the sites were slightly different. The authors propose that Rio Secco cave was used by bears for hibernation, the period over the winter where they sleep to conserve energy. There are clues around the cave that indicate it served this special purpose like scratch marks and shiny areas on the cave walls polished by bears rubbing past them . 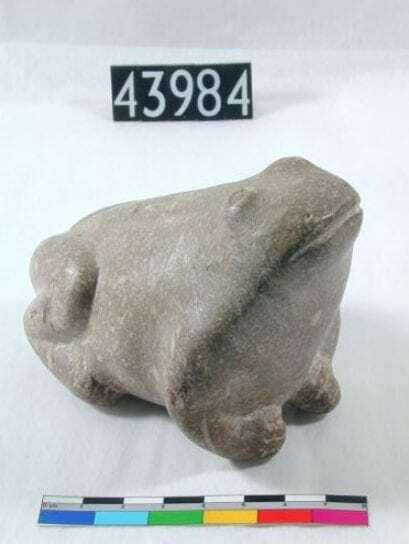 This is a phenomenon called Bärenschliffe and is discussed in this great blog post by Ross Barnet on the website Twilight Beasts. The animal remains found at Rio Secco are reported from two archaeological layers, one layer contains 39.3% cave bear and 1.6% brown bear; and the other 27% cave bear and 0.2% brown bear. Many of these bones have cut marks indicating butchery by Neanderthals, suggesting that the cave was actively targeted to exploit the hibernating bears as a food resource. This is supported by the scarcity of other resources in the surrounding landscape—like flint used to make tools—meaning people probably wouldn’t have been in the region hunting and gathering more generally. Instead they were making specific organised trips to hunt the bears! The human signature at the Fumane site is noticeably different and the authors suggest archaeological evidence represents periods of intense and repeated Neanderthal occupation. 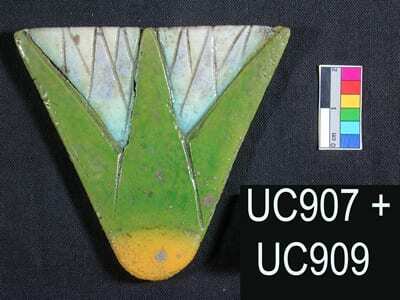 The assemblage contains a wide variety of butchered fauna demonstrating that food resources were plentiful, and the site is situated in a raw material rich region. In this case it appears that unfortunate bears were an occasional item on the menu rather than the specific reason the humans were present! This is supported by the lack of bear remains, which only amount to 2.2% and 1.4% of the two archaeological layers reported. The authors state that it is harder to differentiate between the types of bear as some skeletal elements are missing but overall there are more brown bear present. This absence of some bones particularly the back bone and pelvis indicate that the bears were butchered elsewhere, and prime cuts of meat brought back to the cave. Overall these contrasting archaeological contexts suggest very different hunting behaviour at both caves with the former a targeted resource and the latter a more opportunistic way of hunting. There are two exciting implications from this study; it adds to the body of evidence that Neanderthals specifically targeted megafauna using a sophisticated knowledge of animal behaviour. It also provides more indication for co-operative hunting in Neanderthal populations—I certainly wouldn’t want to try to take down a bear on my own, even a sleeping one! Romandini, M., Terlato, G., Nannini, N., Tagliacozzo, A., Benazzi, S. and Peresani, M., 2018. Bears and humans, a Neanderthal tale. 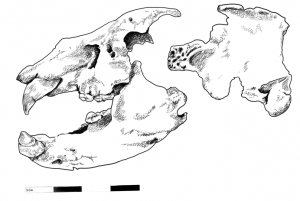 Reconstructing uncommon behaviors from zooarchaeological evidence in southern Europe. 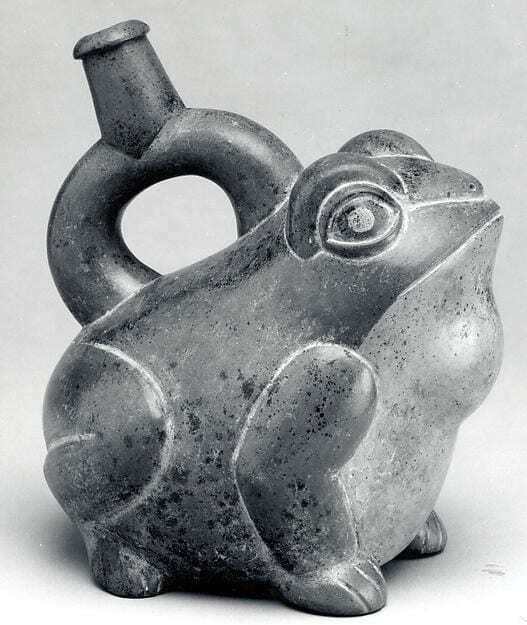 Journal of Archaeological Science, 90, pp.71-91. Also a big thank you to bear specialist Tabitha Paterson for advice! What happens if a Neanderthal bites you? Neanderthals have a pretty robust bone structure in comparison to anatomically modern humans and the differences in facial bone structure are particularly striking. In the image below, you can see several of these features, like the high domed cranium and distinctive occipital bun (the pinching at the rear of the skull). To the front of the skull you might notice the large nasal aperture (hole from nose into head) and heavy brow ridge. They also have an extremely strong looking jaw! 1.) A stronger biting force. 2.) The ability to process large amounts of air quickly. 3.) More efficient survival in cold climates with dry air. Recent research by Wroe et al. (2018) aims to shed light on this debate. 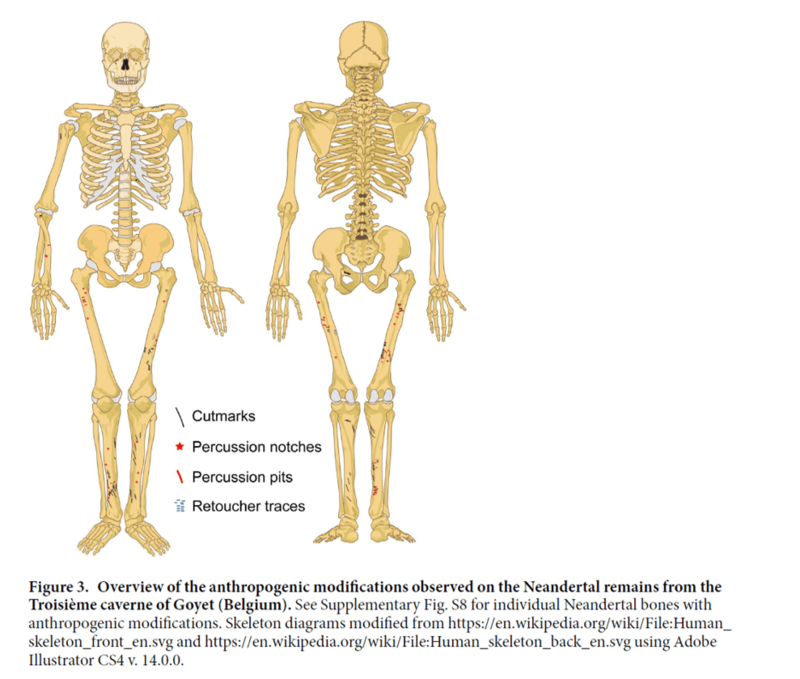 Researchers analysed the biomechanics of bite strength across different hominin species, focusing on Homo heidlbergensis, Homo neanderthalensis and Homo sapiens. They used CT-scans of multiple crania to establish the bite efficiency in the different hominins. The results suggested that Neanderthal bite strength was very similar to Homo sapiens and in fact anatomically modern humans could bite more efficiently using fewer muscles. The analysis also demonstrated that both species had nasal cavities that were adapted to condition air efficiently but Neanderthals could take significantly more air into their nasal pathway. 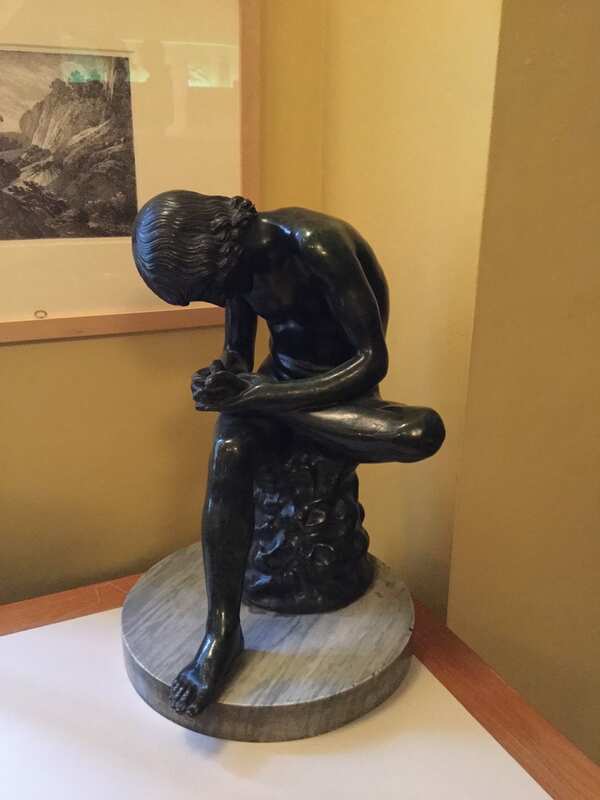 Poor Heidlbergensis was the worst at everything… but that’s perhaps unsurprising as it is an older, less derived (evolved), member of the human lineage. These results strongly support the theory that Neanderthals facial anatomy was adapted to high energy activity in cold, dry, climates. This makes sense in terms of the Neanderthal range and the fact that they evolved and lived outside of Africa. There is evidence of Neanderthal populations surviving during very cold periods of the Ice Age, for example at La Cotte de St. Brelade in Jersey. There are archaeological deposits from this site that date to Marine Isotope Stage 6 (between 191 – 130 thousand years ago), a time when cold conditions prevailed. This new evidence also fits well with Neanderthal post-cranial adaptations like their large barrel shaped rib cage and short, stocky, stature. These features may have helped to improve survival in cooler climes by aiding air processing and retention of body heat. 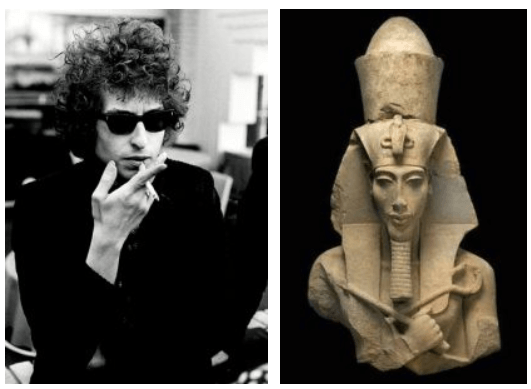 What if Bob Dylan became Pharaoh of Egypt? If I were to invent a new board game, I’d call it “Who are you now?” Players would have to imagine who historical figures would be if they were alive today. Alexander the Great? A corporate raider leading hostile takeovers and selling dismantled companies to the highest bidder. Christopher Columbus? The captain of the first mission to Mars. Jean Jacques Rousseau? Head of a yoga ashram and wellness retreat in the Cotswolds. 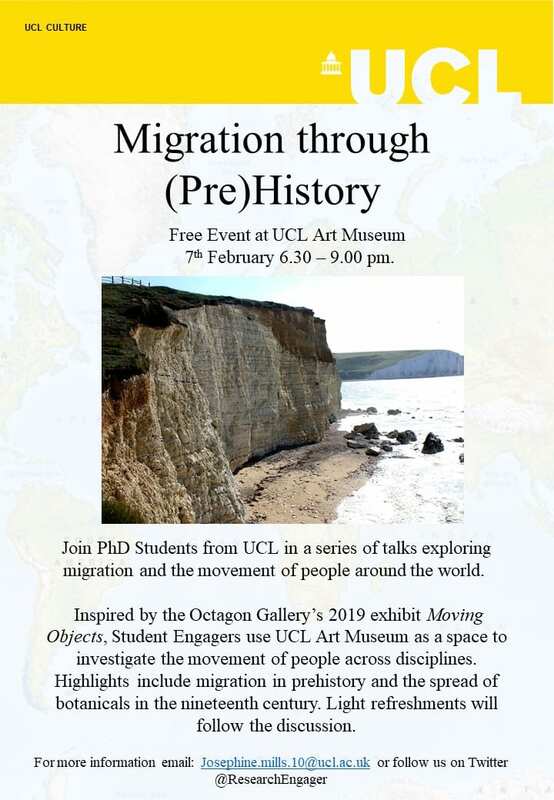 And Akhenaten, the iconoclastic pharaoh of the 18th dynasty, artefacts from whose reign are on display at UCL’s Petrie Museum, would definitely be Bob Dylan. At first glance, the son of Amenhotep III and the folk singer from Hibbing, Minnesota may not seem like brothers from other mothers. Fair enough. The two men’s lives are separated by nearly three thousand years, and many more thousand miles. But the careers of king and artist, both of whom defined the cultures of their respective periods, evince intriguing similarities. Let’s consider some points of convergence, shall we? 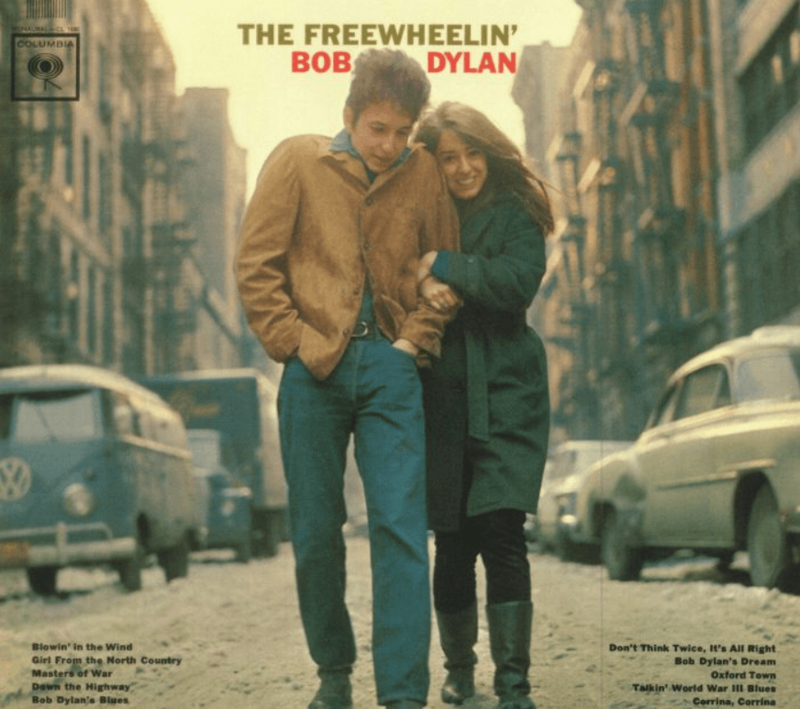 Bob Dylan’s breakthrough album, The Freewheelin’ Bob Dylan, was released in 1963 (bobdylan.com) and launched a folk revival which defined popular music for the remainder of the decade. After the dominance of Frank Sinatra-style crooners in the 1950s, Dylan’s productions—featuring simple arrangements and complex, poetic lyrics sung by a vocalist of limited range—were a complete departure from the musical mainstream. Akhenaten likewise upset the artistic establishment. Have you ever tried to “walk like an Egyptian”? Traditional Egyptian reliefs employed multiple viewpoint perspective, a technique which presented the parts of the human body in the positions in which they appeared most attractive: head and legs in profile (feet staggered) while chest and torso faced the viewer . In contrast, the relief images produced during Akhenaten’s reign featured naturalistic representations of the body; positions and postures were relaxed, and round hips and bulging bellies were on full display. The perception of Dylan in the 1960s as a truth-telling artist of the people led his most devoted followers to view him as a prophet (one more-than-slightly deranged fan picked through his garbage in New York City looking for said “truth”). Surreal, dystopian songs like “A Hard Rain’s A-Gonna Fall” added to the effect. 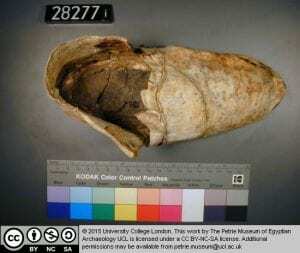 Akhenaten actually did change Egypt’s religion. He was king. He could do that. Ushering in one of the first eras of monotheism in the ancient world, the Pharaoh replaced Egypt’s pantheon of gods with worship of the sun-god in his celestial “disk” form. A revolutionary needs an epic name. Robert Allen Zimmerman, son of a furniture store owner in small-town Minnesota, became Bob Dylan. And Amenhotep IV was reborn as Akhenaten; he incorporated the Egyptian word for “disk” (“Aten”) into his new moniker to honour his one-and-only god. Following a near-fatal motorcycle accident in 1966, Dylan retreated from public life. He went to Woodstock in upstate New York, and other artists followed, most notably The Band, whose debut album, Music from Big Pink, was written in Woodstock and features the classic song “The Weight.” George Harrison of The Beatles also found his way to Dylan’s idyll. Admittedly, Akhenaten went a little bit bigger. In the sixth year of his reign, the King founded a new city in middle Egypt between the government and spiritual hubs of Memphis and Thebes. He called the city Akhet-Aten (today it is known as Tell el Amarna) and dedicated it to his god. 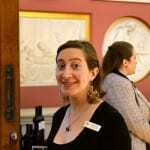 The Collection at UCL’s Petrie Museum includes a number of reliefs and pottery fragments from the city. While Dylan continues to endure, and to frustrate groups like the Nobel Prize Committee (he failed to show up to collect his honour), Akhenaten ruled for only seventeen years. After his death, Tell el Amarna was abandoned, and Egypt reverted to polytheism. The commune broke up. The flower children had to get office jobs. Some revolutions just don’t last. Why did Ancient Egyptians Love Cats? You really wouldn’t want to get into a cat versus dog argument with me (cats are superior obviously) and as it turns out the Ancient Egyptians agree! 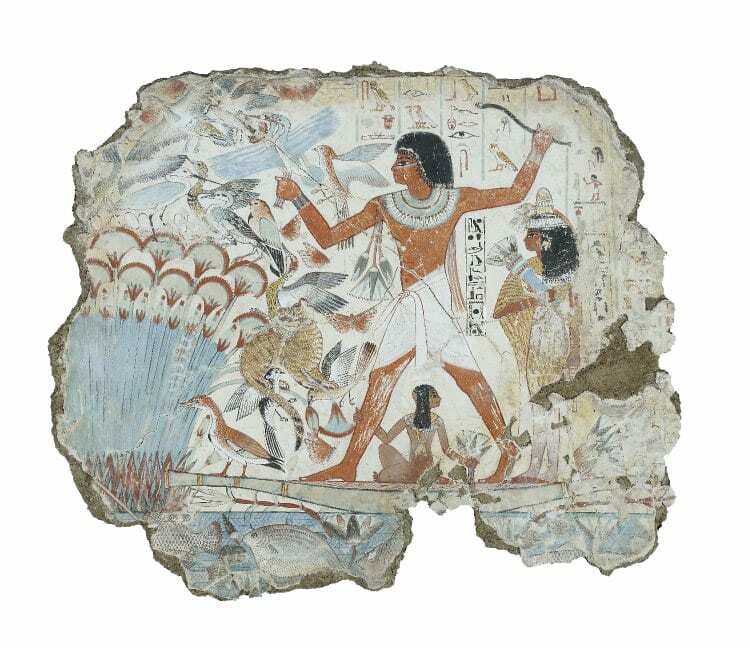 Ancient Egyptian iconography is packed with representations of cats — from tomb paintings to statues, their feline friends were everywhere. But did they always love cats? And why did they love them so much? 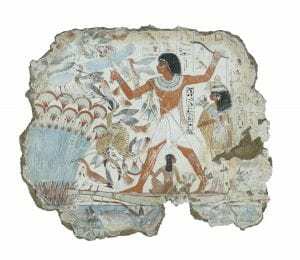 It’s thought that humans and cats began interacting in Ancient Egypt after 4000 BCE as this is when cats start to appear in visual representations like hieroglyphs and tomb paintings. It’s unlikely that these cats were fully domesticated and were probably one of the two species of wild cat that existed in Egypt at the time: the Jungle Cat and the African Wild Cat. Interestingly, although there was more than one type of cat, Egyptians only had a single word for feline, the onomatopoeic ‘miu’ or ‘miit’, meaning literally ‘he or she who mews’. Between 4000 – 2000 BC humans and cats gradually began to live in closer company. Archaeologists believe that the main driving force behind initial cat domestication was their usefulness as pest control. 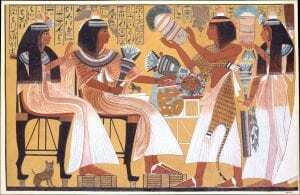 Ancient Egyptian economy was largely based on farming with grain and its distribution was important to many Egyptians livelihoods. Grain was held in buildings called granaries and people realised that granaries visited by roaming cats had fewer problems with vermin. These cats, who had initially just stopped off to snack on mice, were encouraged to stick around and treated with kindness — finally slinking their way into the domestic home around 2000 BC. However, cats didn’t just chow down on small vermin like rodents; they were also known to kill poisonous snakes. 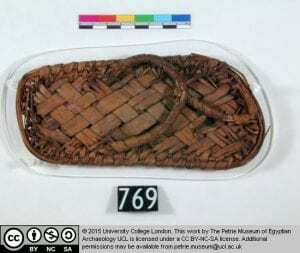 Snakes were a real issue in Ancient Egypt and the presence of cats reduced the threat of poisoning. Through this behaviour, cats were perceived to have a protective nature which, combined with their ability to have lots of kittens, made them a symbol of the home, women, and fertility. Tomb paintings dated to the New Kingdom often feature cats as dedicated companions of women, usually seated under their chairs. 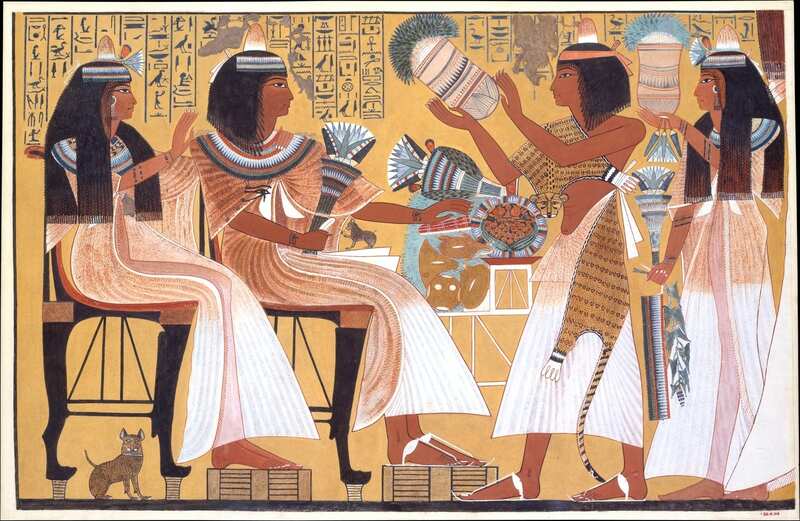 Their representation in popular culture and usefulness around the home and workplace gave cats a prominent position in Egyptian society. Some people were even named after cats, Miut and Miit, Ta-mitt (female cat) and Pa-mitt (tom cat). Killing a cat was punishable by death, even if it was an accident, and when a family cat died it was common for its owners to shave their eyebrows as part of the mourning process. See I wasn’t kitten when I told you cats were important! Cats also had a significant impact on religion in Ancient Egypt, despite being a relatively late addition to the Pantheon (c. 2000 – 1000 BC). 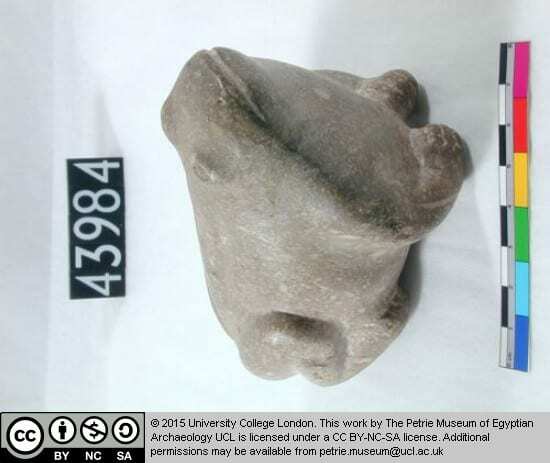 The earliest representation of a cat or lion in Egyptian religion was the fur-midable Mafdet, a cat-like deity associated with justice and execution. Interestingly Mafdet probably translates as ‘runner’, and it’s possible she embodied a cheetah or jaguar. Mafdet was followed by Sekhmet, meaning strength and ferocity, a lion-headed goddess. She played a key part in the Egyptian creation myth when Hathor, daughter of Ra, was transformed into Sekhmet to remind humans of the God’s power (seriously gruesome events ensued). She has a reputation as a ferocious deity but also a stalwart protector of the innocent. Bastet is probably the most famous cat-headed goddess. Much more moderate than her predecessors, she was associated with fertility, womanhood, and the home. Bastet was a very popular goddess through to the Ptolemaic and Roman Periods in Egypt; she even had a cult centre of worship called Bubastis. The Cult of the Cat was not restricted to Bubastis and spread across Ancient Egypt with large temples dedicated to the cat goddesses, which house and cared for hundreds of cats. 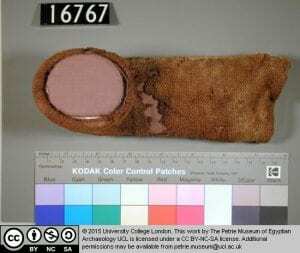 Cats were even mummified in a similar way to humans and placed in temples after their death. 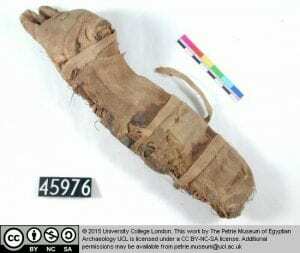 The Petrie Museum has its very own mummified cat (sort of), which is part of the Langton Collection, a substantial bequest of artefacts that are all cat related. They were originally brought together by Mr and Mrs Langton, who excavated and worked in Egypt in the early twentieth century, who wanted to highlight the importance of the Cult of the Cat! There’s ample evidence that Ancient Egyptians loved cats and the prominent role they played in day-to-day life and religious worship. Five thousand years later I’m not sure how much has changed. Incidentally if you’d like to read more about cats in a medieval context (of course you would!) check out my fellow engager Arendse’s blog post. In the archaeological record, ‘cannibalism’, also known as ‘anthropophagy’, is usually identified through studying human bones and analysing any cut marks left on them that were made by stone tools. These cut marks would have occurred during the process of de-fleshing, or excarnating, the individual. Cutmarks are used as evidence of cannibalism and have been reported at several different Neanderthal sites, like El Sidron and Goyet Cave; however, incontrovertible proof of intentional cannibalism is relatively rare. When analysing marks on bones, archaeologists observe the taphonomy of the find; this means trying to untangle what has happened to it since it was deposited from its systemic (or life-time) context. 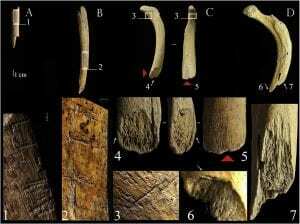 In some cases, reports of cutmarks made by Neanderthals have been re-analysed and interpreted as damage from carnivore activity or environmental processes. Cutmarks are found in predictable patterns. 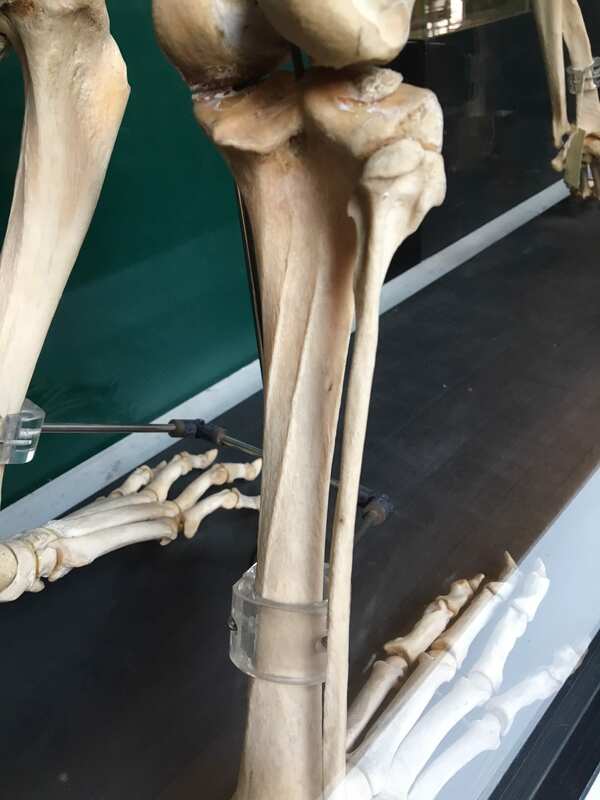 For example, upper limbs are usually disarticulated (removed from the body) whereas lower limbs, which have a higher nutritional value, are de-fleshed. At Goyet Cave in Belgium, cutmarks found on Neanderthal rib bones have been used to suggest evisceration and removal of the chest muscles (Rougier et al. 2016). There is also evidence of percussion marks on thigh bones where they have been struck to extract the bone-marrow, which is highly calorific. The main evidence for brain-eating derives from cut marks and percussion marks found on Neanderthal crania, suggesting skulls were exploited to get to the brain, which is also a very nutritious organ. Human bones often occur alongside animal remains and one of the most important criterion for identifying cannibalism is whether both types of bones have been treated in the same way. If this is the case and human bones are butchered just like animal bones, then it’s likely that nutritional cannibalism took place. 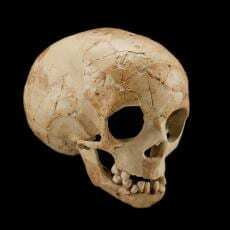 It’s hard to say whether all Neanderthals practised nutritional cannibalism as we know that their behaviour varied across different regions and timescales. It may have been a behaviour that occurred out of necessity during periods of nutritional-deficit, when sufficient animal and plant resources were scarce. What are the repercussions of anthropophagy? 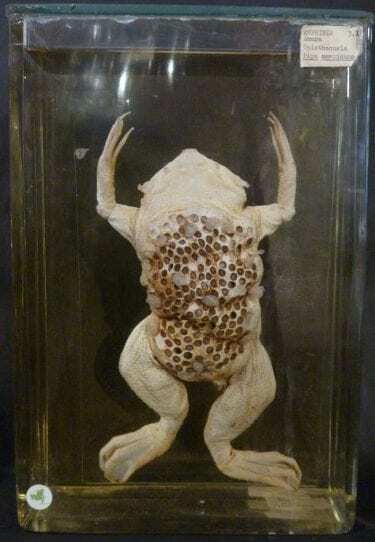 Anthropophagy is taboo and it’s a bad idea to eat people; in a modern context it’s socially unacceptable but there are also potential health issues particularly related to eating certain parts of the body. Eating brains can expose you to prions, a type of protein generally found in the central nervous system. Everybody has them, however some types of prion can act as infectious agents inducing abnormal folding of otherwise healthy prions. These abnormal prions can occur through genetic inheritance, sporadic mutation, or infection. The brain is the most vulnerable organ if exposed to infectious prions. Abnormal folding causes the degeneration of white matter, making the important parts of the brain spongy. This explains why prion diseases are neurodegenerative, causing symptoms like loss of co-ordination (cerebellar ataxia) and muscle control. They are fatal and there is no current cure. You might have heard of the prion diseases Creutzfeld-Jakob disease (CJD) or Bovine Spongiform Encephalopathy (BSE – ‘mad cow’ disease). One of the reasons that the BSE scare occurred in the ‘90s was that farmers were feeding cattle a form of slurry that was made by combining the carcasses of other livestock, greatly increasing the living animal’s likelihood of ingesting infected brains or parts of the nervous system. This became illegal and when the practice stopped so did the elevated cases of BSE. Probably the most famous outbreak of prion disease is the Kuru, which originated amongst the Fore tribe in Papua New Guinea. In Fore, Kuru literally means ‘the shakes’ referring to loss of muscle control. It’s believed that Kuru originated from one individual in the tribe who experienced a sporadic prion mutation but that it spread so effectively because the Fore practiced ritual anthropophagy until around 1950. 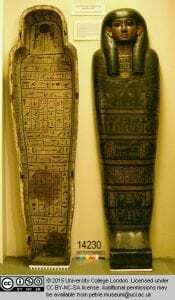 Anthropophagy was a key part of their mortuary practice as it involved both honouring and passing on the strength of the deceased. 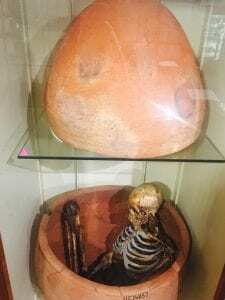 Kuru was most prevalent in women and children as they consumed most of the nervous system and were responsible for the practical excarnation of the dead. At its height, the Kuru epidemic killed around 2% of the Fore women annually. If you’ve played the video game Far Cry Primal, the tribe based on Neanderthals, ‘The Udam’, suffer from the fictional terminal disease ‘skull-fire’ that is probably inspired by Kuru. This disease is instrumental in their ensuing demise and the supremacy of modern humans (in the video game!). 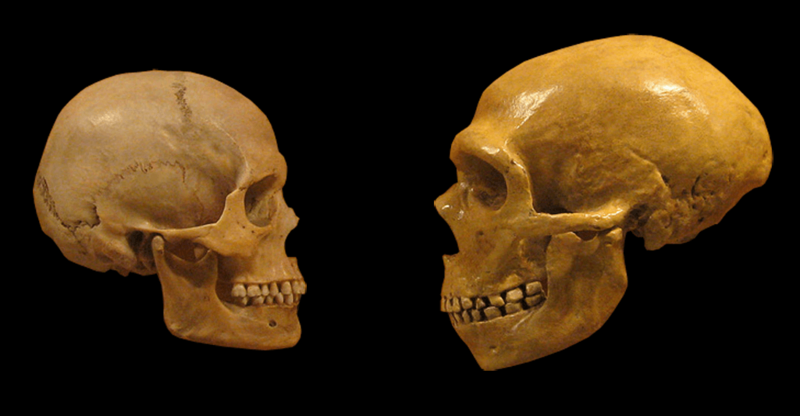 Neanderthals likely lived in small family groups and were highly mobile. Therefore it seems unlikely that a prion disease could become ubiquitous and have had long-term impacts on their overall survival as a species. Although there are fringe theories that do suggest this, there are many Neanderthal remains found without signs of cannibalism. As more information about genetics and population dispersal becomes available, it seems very unlikely that the assimilation/extinction of Neanderthals was down to prion disease. The reason that Kuru was so established within the Fore tribe is a combination of both the presence of infectious prions and a very established routine of ritual cannibalism. Basically, eating more brains does not cumulatively give you prion disease but if you do consume brains the probability that you will ingest a brain that has infected prions is much higher – making you much more likely to catch a prion disease. Anatomically modern humans and ritual cannibalism. 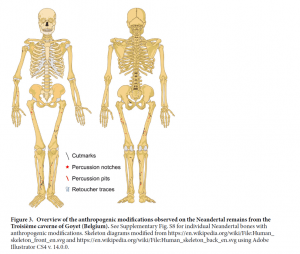 Ritual cannibalism is harder to recognise in the archaeological record than nutritional cannibalism and, so far, hasn’t concretely been reported in Neanderthal populations. However, osteoarchaeological finds from a site in Southern England called Goughs Cave strongly imply that anatomically modern humans practiced ritual cannibalism. The evidence is quite gory with bones even showing signs of being chewed by other humans! Ritual cannibalism is suggested because three of the skulls were shaped to create cups or bowls and one bone has been engraved. Rougier, H., Crevecoeur, I., Beauval, C., Posth, C., Flas, D., Wißing, C., Furtwängler, A., Germonpré, M., Gómez-Olivencia, A., Semal, P. and van der Plicht, J., 2016. Neandertal cannibalism and Neandertal bones used as tools in Northern Europe. Scientific reports, 6, p.29005. 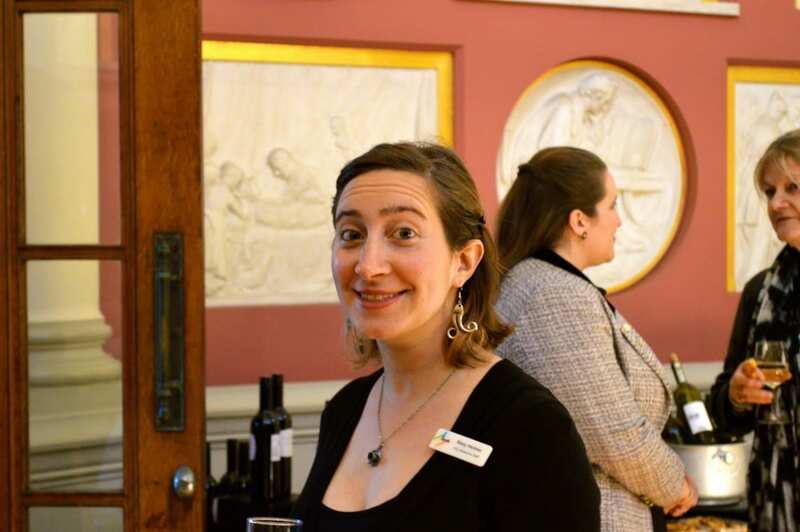 Is Burial a Modern Human Behaviour? Both the Grant and the Petrie Museums contain regular reminders of death, burial, and what comes after. The animals and skeletons preserved in the Grant continue to contribute to studies of comparative anatomy, education, and public outreach in the museum. In the Petrie, there are many examples of how Ancient Egyptians treated death and the afterlife, including the wooden coffin of Nairetisetnefer on display at the back of the main room (figure 1). Burial and mourning have long been associated with human-ness. Historically, we’ve thought of the process of understanding death, and what may come after, as something that can only be conceptualised by Homo sapiens. However recent observations of mammals (like the elephant) suggest that mourning, or observation and reaction to death, are not unique to humans as a species. From an archaeological perspective, burial is generally classed within the suite of ‘advanced’ behaviours (alongside personal adornment, symbolic behaviour etc.) 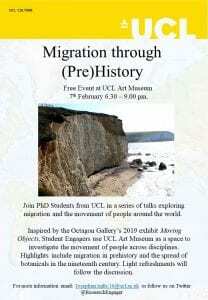 that appear in the archaeological record around 40,000 years ago, coinciding with the widespread dispersal of anatomically modern humans (aka H. sapiens). The timing and proliferation of these burials means that they are generally associated with a period called the Upper Palaeolithic. 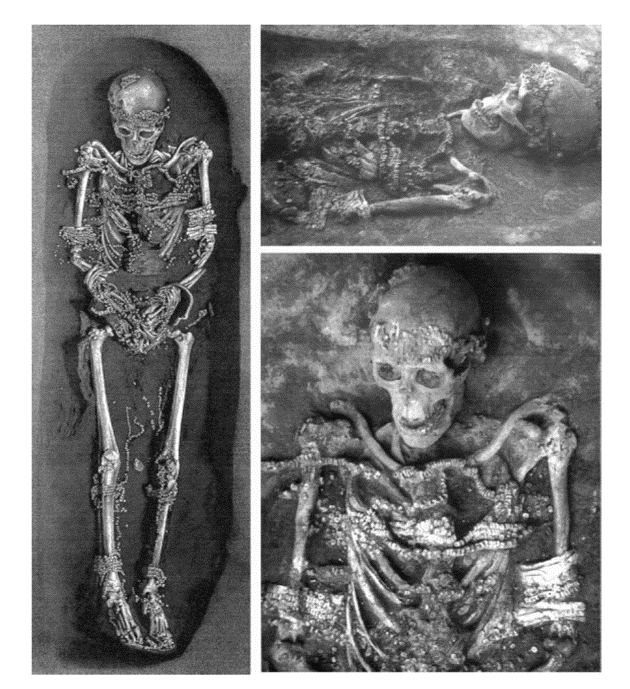 Some Upper Palaeolithic burials are easy to recognise in the archaeological record as the individual(s) is interred in a well-cut grave alongside grave goods, like the burials found at Sungir in Russia (figure 2). These well-known burials are probably not representative of widespread mortuary practice instead representing high-status individuals. Types of burial varied substantially across the Upper Palaeolithic world, for an overview of the diversity of burials in Eurasia check out Riel-Salvatore and Gravel-Miguel (2013). Did other hominins further back into the past practice burial? One of the most important things to consider is what the word ‘burial’ means. In a way, it can be a loaded term indicating direct intention to preserve or honour an individual, hinting at aspects of the deceased’s relationship with the living and perhaps thoughts for their journey into something like an afterlife. This process demonstrates a whole lot of complex thoughts and ideas. However, from a practical perspective the idea of burial also encompasses things like the removal of deceased from occupation sites, thereby minimising the risk of disease and attraction of dangerous carnivores, a behaviour Pettit (2013) calls ‘funerary caching’. This would make some burials in the past a slightly more practical option. In an archaeological (particularly a Palaeolithic context) how do you tell when somebody has been deliberately buried? Bones in the skeleton remaining in the correct anatomical location and still being attached to one another indicating a high degree of skeletal articulation, which suggests that the deceased was interred relatively rapidly after death and was not disturbed post-mortem. The preservation state of the bones can also hint at deliberate burial as they are less likely to be broken by disturbance if the individual has been protected by a grave-like structure or set aside in a specific place. 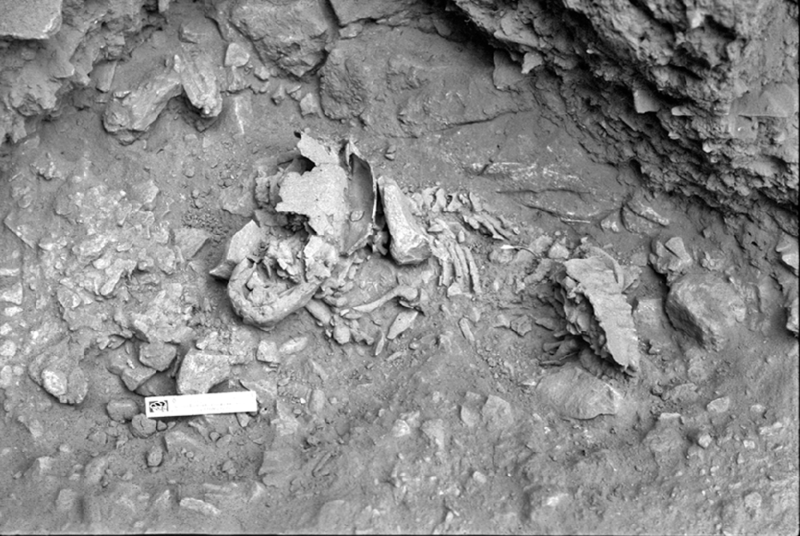 This is seen in the articulated burial of a two-year-old child Neanderthal child (Dedriyeh 1) in Syria (Pettit 2013; figure 3). Association of grave goods with burials, such as flint arrowheads or inclusion of animal remains, like the red deer maxilla associated with Amud 7 Neanderthal burial (Pettit 2012). These items are particularly important if they are unusual or uncommon in the surrounding excavated area, making it more likely that they were placed with the deceased on purpose. Looking for some sort of grave-like depression, a hollow dug into the ground or an area to the side of a cave where a body is placed under a rock or in a natural shelf. I study Neanderthals and have written in the past about how they are often given a tough time in popular media for being brutish, unintelligent and lacking in the advanced behaviours of modern humans. The burials mentioned above were made by Neanderthals, however all post-date 70,000 years ago meaning they occurred relatively late in the Middle Palaeolithic (the time when Neanderthals were around); they are also not found consistently across the Neanderthal world (Pettit 2013). From the available evidence, it seems that burial was not a ubiquitous behaviour; however, a preservation bias probably exists because the further you get into the past the more likely archaeological remains are disturbed. Equally Neanderthals were highly mobile hunter gatherers so the chance of finding and excavating their occupation and burial sites is rare and finds are generally seen in cave systems. This is both due to the shelter from environmental processes provided by caves and their recognised potential as archaeological sites, meaning they are excavated more often than open-air sites. Neanderthal burial is a controversial topic and some of burials are contested, particularly if the term is defined by modern human standards, e.g. the deceased is found interred in a dug grave alongside grave goods. It’s likely that the origin of burial, as suggest by Pettit (2013) who has written in detail about the subject, is in the Palaeolithic but it is improbable that somebody somewhere in the past woke up and invented the concept of burial as we understand it today. It is more plausible that mortuary practice evolved in various places at separate times and has some roots in the practicalities of death for living populations. For a final thought, although excavated burials generally post-date around 70,000 years ago (late in Neanderthal evolution), new discoveries like the structures in Bruniquel Cave (Jaubert et al. 2016), which have been reliably dated to 170,000 years ago, reveal a deepening complexity in observed Neanderthal behaviour; alongside finds like this, it doesn’t seem out of this world to think that some form of mortuary behaviour was seen earlier in the human record. Incidentally there’s also rather a lot of evidence for excarnation by Neanderthals and Anatomically Modern Humans, but that’s for another blogpost! Pettitt, P. (2013). The Palaeolithic origins of human burial. Routledge.